We’ve encouraged health care providers and patients to have “What matters to you?” conversations each and every day over the past year. Now it’s time to celebrate the genuine partnerships these conversations helped form on “What Matters to You?” Day on June 6! As we gear up for the celebration, we’d like to invite you to attend a lunch-time webinar where patients and health care providers will share their stories and experiences with starting conversations and building genuine partnerships. 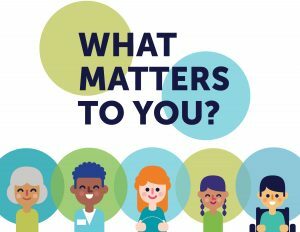 Join us to learn more about how “What Matters to You?” has impacted relationships between patients and care providers, and how it can be implemented within care!